Discover just what the typical tuition is for U.S. schools, and how Biola compares. Understanding the tuition related to going to Biola means that you can plan economically for 4-6 years. 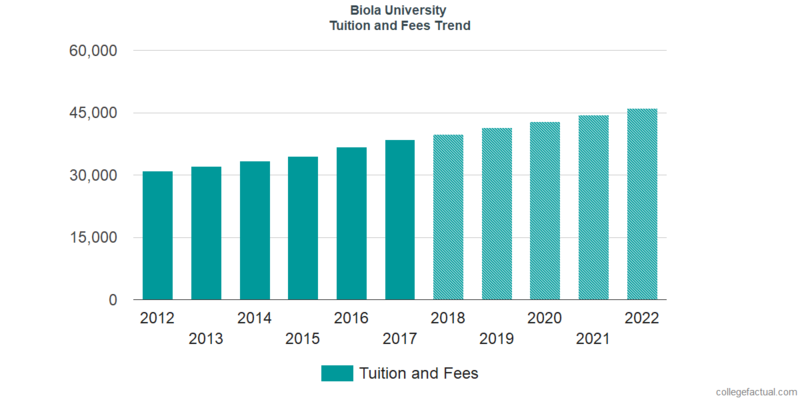 Check out the numbers following to understand how Biola's price compares to other colleges and universities and if you need to plan for tuition increases. How do Tuition & Fees at Biola Measure Up To Other Colleges? The following table shows how Biola compares to other colleges nationally, regionally and by state. How Much Does Biola Charge for Tuition? Full-time undergraduates at Biola University were charged $38,448 in tuition and fees in the 2017 - 2018 school year, prior to adjustments for financial aid. Of this amount, the price of tuition totaled $38,448. Biola University tuition and fees is the sum charged to students for one year of attendance, and does not include room and board. Keep in mind many students obtain financial aid and scholarships that decrease their total cost. How much does Biola cost part time? There continues to be a rise of 3.7% in Biola University tuition and fees for out-of-state students in the past five years. Tuition expanded by 3.7% and fees expanded by 0.0%. This school year, students can anticipate paying $39,859 if the growth keeps up. Because of price growth, the total expense of a four-year Biola degree would be $168,430, and the total expense of a two-year degree would be $81,181, which doesn't include extra costs for books, transportation, and room and board. Take a look at this next chart to find out how Biola tuition and fees might develop in the years to come. At a lot of colleges you'll wind up spending more in your final year of school than you will in your first. This is because of annual cost growth. It pays to keep yourself informed!